A recent study conducted by PricewaterhouseCoopers as part of their Consumer Intelligence series found that Netflix is now neck-and-neck with cable TV. The survey of 2,000 adults found that 73 percent of respondents pay for linear TV (cable), down from 76 percent a year ago and 79 percent in 2015. On the flipside, 73 percent of respondents reported having a Netflix subscription. Netflix first introduced its streaming media product ten years ago. 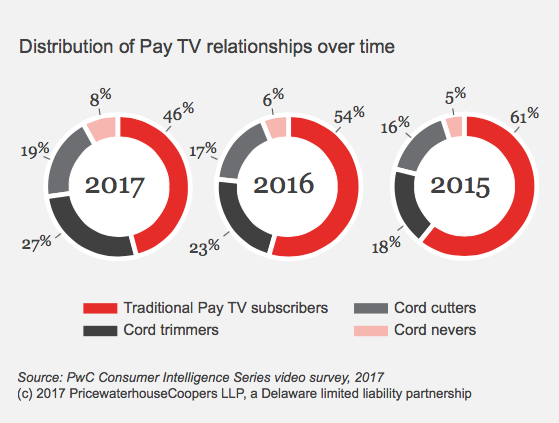 A testament to the growth of streaming media more broadly, 46 percent of respondents in the PwC survey said they’ve cut or “trimmed” the proverbial cord in the past year. That’s bad news for cable providers, as nearly half of the adults interviewed reported a decrease (if not total elimination) when it comes to their cable viewing habits. Interestingly, streaming isn’t just for digital natives (millennials and Gen Z-ers) either. PwC concluded that there has been “an explosion of streaming for all ages,” and cited that 63 percent of respondents between 50 and 59 said they stream TV compared to 48 percent in 2016. For reference, 87 percent of those surveyed between 18 to 24 and 90 percent of those between 25 and 34 answered the same. One of the main challenges posed by over-the-top TV and streaming video? Clutter. PwC’s study shows that, on average, U.S. adults utilize four services including Pay TV and digital platforms, though only two of these are utilized regularly. Further, only one-quarter of consumers say they can handle using more than four services on top of Pay TV. As we’ve seen with other digital channels, social media included, the preponderance of choice seems to be a blessing and curse for consumers. With fragmented distribution comes new challenges when it comes to earning and keeping attention. As far as what’s next for Netflix, per a recent report by The Observer, Netflix has a content budget of $8 billion set for the upcoming year—a strategy that makes a lot of sense given in the most recent quarter the company boasted an additional 850,000 U.S. subscribers, helping it hit the 50 million mark. On a global scale, there are approximately 110 million total accounts to date.